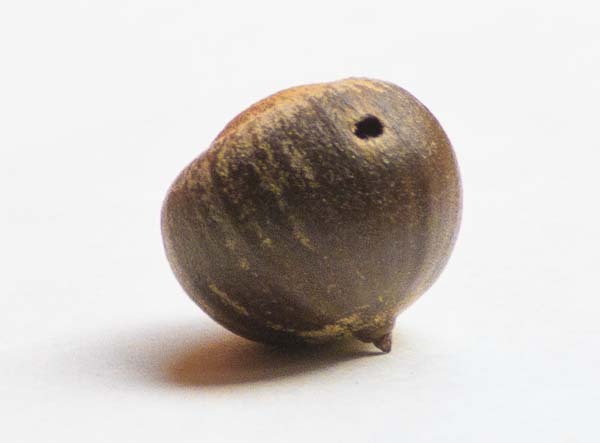 Have you ever found an acorn with one or more small, perfect holes and wondered what kind of insect left it there? Weevils are beetles and members of the insect order Coleoptera. The life cycle of the acorn weevil takes one to two years. The brown, 3/8” adults emerge in the spring and the female begins laying eggs in acorns in midsummer while they are still maturing on the trees. She makes one or more holes per acorn with the mouthparts at the end of the snout and deposits a single egg in each hole. After the larvae hatch, they feed within the acorn and are capable of consuming the entire nutmeat. The legless larvae grow to about ¼ to 3/8” long and are creamy white with brown heads. After the acorn falls to the ground, the larvae emerge and burrow into the soil. They remain there for one to two years before pupating and emerging as adults in the spring. Where there has been acorn weevil activity, it may be hard to find acorns without any holes. This is because squirrels leave them behind, knowing that they are not going to provide a good meal. Smart squirrels! 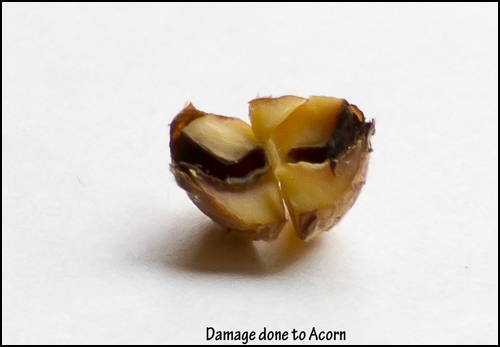 Acorn weevils don’t usually harm the rest of the tree in any way so control is not practical or necessary. This short video shows the larva emerging from an acorn. It’s pretty entertaining because the larva is much bigger around than its hole so it has to work pretty hard to get out. Remember when Winnie the Pooh tried to get out of Rabbit’s house after eating too much honey? That’s the idea. And here’s a warning for the sentimentalists: the ending is sad. 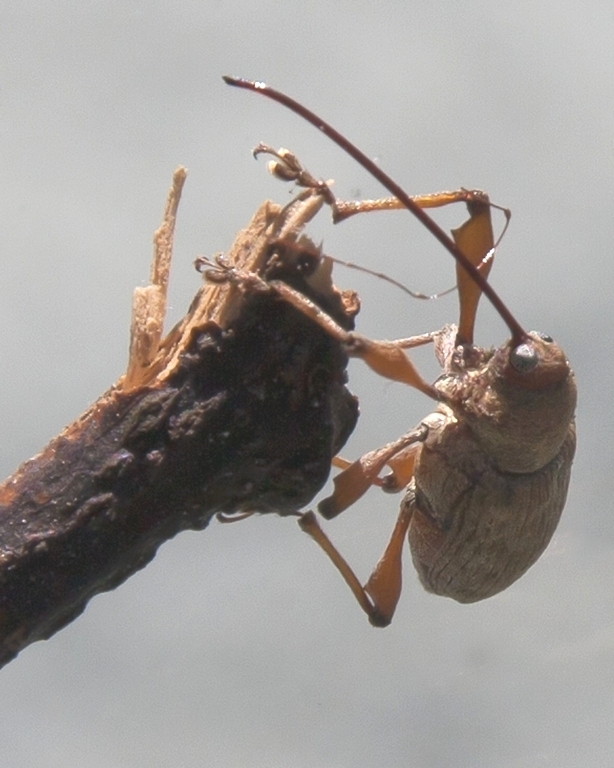 What eats (or kills) the acron weevil ? Birds and ground beetles can and will eat adult acorn beetles and their larvae in the soil. Would love to see the video but can’t access — any thoughts? Sorry Hmmmmm, The video is now unavailable. Have seen these holes all my life and took them for granted. Now I am enlightened! Enlightenment is easy once we stop taking things for granted. I was like the guy who failed the Geology exam because he took it all for granite.